Size: 6-8" high, trailing to 30"
Great when allowed to spill over the edges of good-sized containers (at least 3 gallons) or large hanging baskets. Or, space about 1.5-2' apart, depending on if staking or allowing to sprawl, in moderately fertile, well-drained soil that has adequate phosphorus, potassium, and calcium. Staking is recommended, but not required. Do not grow near fennel. 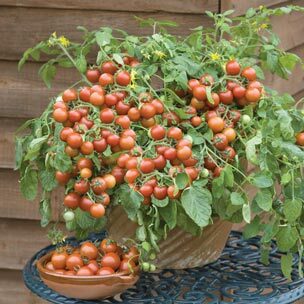 Flowering: Small yellow flowers yield delicious red cherry tomatoes.